Ole Miss originally were named The Flood when they started the football program way back in 1890. Due to a student body vote in 1935, the school renamed the teams to the Rebels. 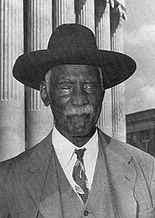 The inspiration from the mascot we sorta know today came from a popular campus fixture by the name of Blind Jim Ivy. Ivy was a peanut vendor and attended most Ole Miss athletic events as well as giving many pep talks to incoming Freshmen. Ivy was considered the school mascot until his death in 1955. After Ivy passed on and new costumed Rebel appeared in 1979. So let’s take a look at the costumed Colonel Reb. Most times he’s dressed up in the southern gentlemen special with some nice suit pant threads and a big ole hat. When he’s on the football fields, he keeps the hat but dresses up in some shoulder pads and some shorts. We very much prefer the slick looking setup of the full suit over the gear setup, but do like that he has more than one pair of pants to walk around in. The head is the typical mongoloid variety, complete with big white bushy hair. The recent history for Colonel Reb isn’t so black and white. Much of what was happening for athletic teams and issues with ethnic mascots usually come from a direct stereotype under abuse. For Colonel Reb, it wasn’t what he was representing (he looks more like Colonel Sanders), but what the idea of the time Colonel Reb represented. 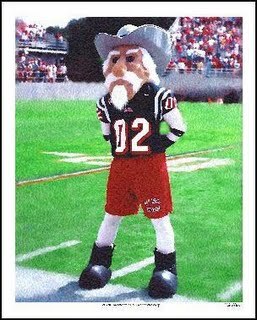 In 2003 Ole Miss officials decided to ban Colonel Reb from the sidelines during the games. This came from growing pressure about the mascot. The pressure wasn’t from the typical sources. Head coach at the time Tommy Tuberville complained that it hurt recruiting players. Where a school who only became integrated in 1962 to now trying to compete at a high level with other schools, they needed to take every step ensuring that the school is open to all colors, especially the athletes. It didn’t begin with Colonel Reb, however, as they banned the confederate flag at school functions way before they axed the Reb. The only real casualty is Colonel Reb. When new mascot suggestions were made, the turnout from the students were too poor to move forward. So what we have now is the only school in the biggest football conference in the land, the SEC, without a mascot to cheer on the team during games. There are even websites up to help save the mascot and bring him back. 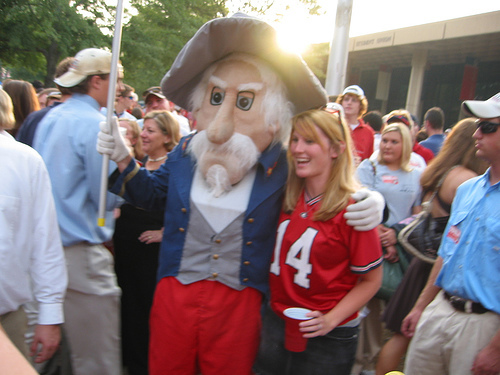 Currently the Colonel Reb Foundations sponsors ‘unofficial’ visits of a Colonel Reb mascot to tailgating functions before the game. The school should come with up something. They should even go as far as to hire some of the bigger media firms who specialize in team logos to produce. They need something to uniquely identify the school and help move merchandise for the program. 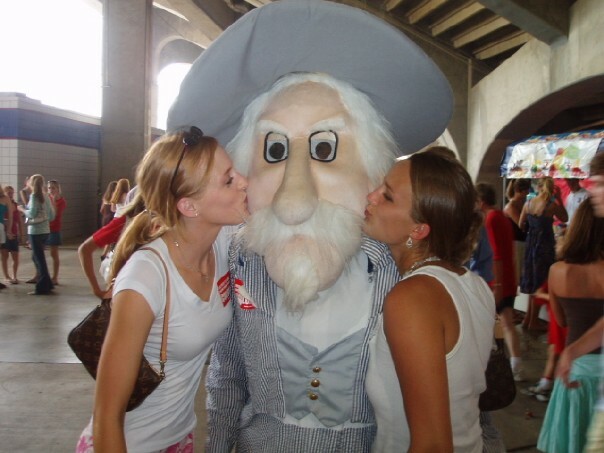 Yes, Colonel Reb lives on tradition and brings controversy. So why not come up with a happy middle point that can make everyone happy? That’s the true American way. The Mascot Mondays from the last year celebrate the life of mascots and what they bring to the table. This last one is the unfortunate case of eliminating an important of the game day chemistry, loved from children to old. Ole Miss must come up with a mascot. We’ll even feature it the next time around when we start year two of Mascot Mondays. It’s been a great time in the offseason and we hope you enjoyed the ride as much as we did. Remember that the next time you see a mascot at your college football game and give him a big, fury, wobbly-eyed hug.